Maybe it's the cold turn in the weather, but I have found myself wondering a lot more about the 'what if?' type of scenario that could unfold this year and next. The bad variety rather than the good. 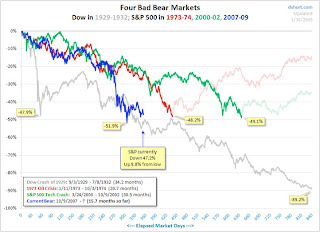 The chart - from Calculated Risk - shows that the current bear market (as measured by the Dow Jones) is nearly down to where the Great Depression was at this point after the start of the decline. Worrying that. Also in the Cassandra camp is Nassim Taleb. In a fascinating Edge @ DLD discussion with Daniel Kahneman last week he both savaged economists ('econometrics is a form of entertainment' - 27 minutes into the talk) and bankers. Worth watching the whole thing in glorious hi-definition if you have the time (for Kahneman's contributions, not just Talebs). On the bankers, Taleb wants them nationalised and run as boring utilities. Let the hedge funds do the risky stuff - they can keep all the profits AND incur all the costs (not the taxpayers) if they blow up. Willem Buiter has gone one better - instead of going down the route of the 'bad bank' idea, he wants Governments to create a 'good bank': and let the rest muddle through or collapse under the weight of their bad decisions. It would certainly be the least worst solution if the banks don't start lending again, storing away any taxpayer financed capital injections as not intended. A kind of zero-based banking if you like. 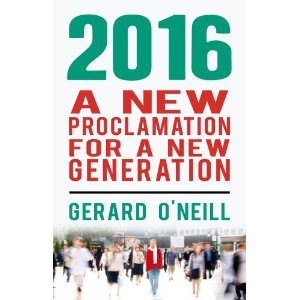 Ireland looks like going down a hybrid route of nationalisation, re-financing, insurance and whatever-you're-having-yourself. It doesn't exactly inspire confidence and the international markets appear to agree for now. Mind you, if the worst comes to the worst, we the taxpayers could always write to the banks demanding our money back 'or else': as suggested in this delightful letter to the Western banking establishment by Tim Price. Might be useful to have a draft ready just in case.